Simple - Featuring day, date, chrono and countdown. Lockout Feature - Which means your chrono and countdown timer is never interrupted. Comfort - The supple custom molded silicone band and patented locking looper make for a watch that stays put and stays comfortable. Bright - Ultra thin electroluminescent backlight. Lightweight - Light as a feather, weighing in at just 46 grams. Strong - Case strength is paramount. Comp features PMMA, a modified thermoplastic material, to achieve a surface that's scratch resistant and built to handle high-impact situations. The thinnest (8 mm), fully featured 100 meter/10 ATM watch ever, designed to never be in your way. 38 mm case made of PMMA, a modified thermoplastic material, to resist scratches and withstand impact. Ultra thin electroluminescent backlight with 100 meter/10 ATM water resistance. Supple, custom-molded Silicone band and patented locking looper for a secure, comfy fit. Movement: Ultra-thin custom digital module. 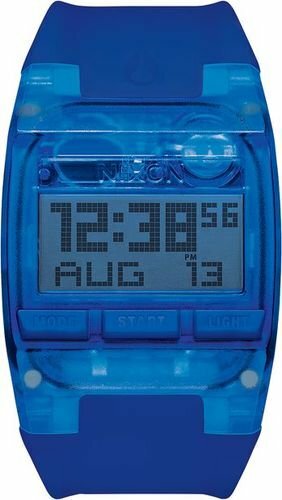 Functions include time of day (12 hour or 24 hour), day/date, dual time, EL backlight, chronograph, and customizable countdown timer. Both chronograph and countdown timer include custom LOCKOUT feature, that allows user to lock the function to ensure nothing interrupts the chronograph or timer functions. 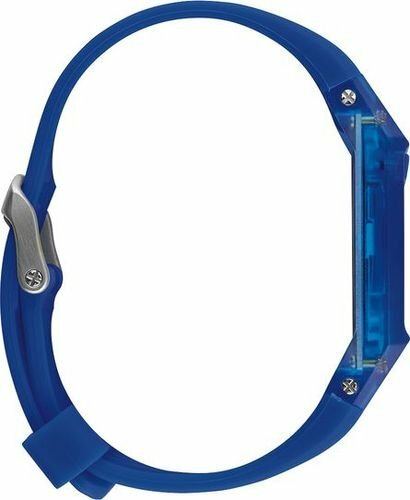 Band Material: Custom injection molded ultra-soft silicone tapered band with a patented locking looper and a solid stainless steel buckle with screw-bar attachment. 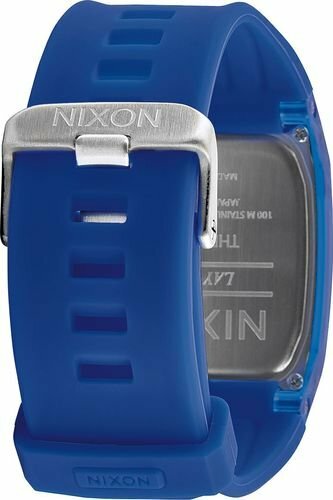 Dial Features: The display is either a positive or negative LCD, and features custom colored PCB, and custom battery terminal with NIXON logo.